The William J. Kimberling Usher Research Laboratory is an integral part of the University of Iowa’s Stephen A. Wynn Institute for Vision Research. 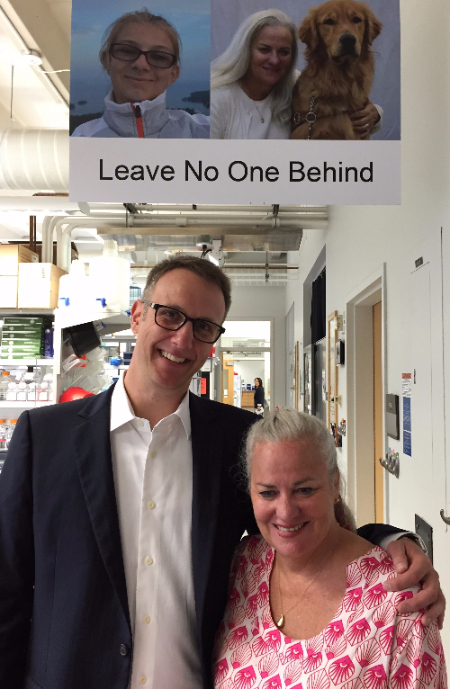 The laboratory is named in honor of Dr. Kimberling’s four decades of outstanding research, which has had, as its ultimate goal, the development of effective treatments for all forms of Usher syndrome, the most common cause of combined deafness and blindness. Dr. Kimberling spent most of his long and distinguished career at the Boys Town National Research Hospital in Omaha, Nebraska, but in later years also held a faculty position at the University of Iowa. This honor was made possible by a very generous donation from Howard F. Ruby, the founder, chairman and CEO of Oakwood Worldwide in California, and an acclaimed nature photographer, philanthropist and environmentalist. The following speech was delivered by Mark Dunning at the dedication ceremony for the William J. Kimberling Usher Research Laboratory. Hi my name is Mark Dunning and I am the Chairman of the Usher Syndrome Coalition, an organization co-founded by Dr. Kimberling. The mission of the Usher Syndrome Coalition to raise awareness and accelerate research for the most common cause of combined deafness and blindness. The Coalition also provides information and support to individuals and families affected by Usher syndrome. I am here today to speak for the families with Usher syndrome. It’s a bit intimidating to be the voice for hundreds of thousands of people, to try to find one thing that they would all want to say. After all, people with Usher syndrome are infants and octogenarians and every age in between. Some have vision, some are blind. Some drive cars. Some use canes. And sometimes they drive cars AND have canes. They are out there. Some have guide dogs like Finnegan. Some can read fine print and some can only see shadows. They have mild hearing loss and profound hearing loss and every level of hearing loss in between. As a result some use hearing aids, some use cochlear implants or some use no aids at all. They use oral communication and sign language and tactile sign. Some of them have balance issues. Some of them can’t walk a balance beam and some of them can ride a horse. And some of them can do both, like my daughter Bella. They live in the country, they live in the city. They come from Washington, DC and Georgia and Iowa and everywhere else in the world. In fact, those hundreds of thousands are spread all over the globe. Bill worked with the Usher Syndrome Coalition to launch an Usher syndrome registry that now contains families from 46 different countries. So people with Usher syndrome speak different languages and have different beliefs and dreams and opinions and outlooks. But all of them have one thing in common. They are now part of a global Usher syndrome community that includes not just those thousands of families but also hundreds of doctors and researchers, all of whom were influenced by Bill in some way. That Usher syndrome community began with Bill decades ago and has grown and grown in confidence and pride and in voice. And now that Usher syndrome community has its apex right here in Iowa at the William J. Kimberling Usher Laboratory. Personally my life changed forever, right here in Iowa, when I brought my then eight year old daughter to see Bill and Ed. I arrived devoid of hope. I left inspired and alive. My journey has led me around the globe and back again, here, to Iowa, with an additional title. I’m still Bella’s Dad but I am also much more. I don’t know where my life would have led without Bill, but I’m pretty sure it wouldn’t have been Iowa. Thank you for giving me hope and the courage to believe. My life is better because of you. Thank you, Bill.